Femoral fracture is a common type of fractures, especially in the elderly. Femoral fracture surgery frequently results in a significant blood loss, which could lead to severe anemia and subsequent need for transfusion, prolonged hospital stay, high hospital cost and a detrimental effect on long-term mortality.1,2 Blood transfusion could correct anemia, but it could cause complications such as infections, hemolytic reaction, cardiovascular dysfunction and even death.2–5 Therefore, it is a significant issue to reduce perioperative blood loss following surgeries for femoral fractures. Tranexamic acid (TXA) is a synthetic amino acid analog, which acts as a competitive inhibitor of plasminogen and finally interferes with fibrinolysis.6 TXA has been reported to be an easily accessible and cost-effective treatment that could reduce the amount of blood loss and subsequent need for blood transfusion, and it has been successfully used in gynecological and obstetric, spinal and thoracic surgeries.7–9 In addition, numerous studies have proved that TXA could decrease blood loss and transfusion rates without increasing the rate of thrombotic events in hip and knee arthroplasty.10–13 However, there is limited data on the efficacy and safety of TXA usage in femoral fracture surgery; whether TXA should be used in femoral fracture surgery remains controversial. So, we performed this meta-analysis to investigate the efficacy and safety of TXA usage following surgeries for femoral fractures. Electronic databases were searched before January 20, 2018 by two independent investigators, including Cochrane Library, Embase, Medline and Web of Science. The references of the included literatures were also checked for potentially relevant studies. Only English studies were included. The key words including “tranexamic acid”, “fracture”, “hemiarthroplasty”, “total hip arthroplasty”, “total hip replacement”, “nail”, “screw” and “open reduction internal fixation” were used. They were combined with Boolean operators. The searched results are shown in Figure 1. Trials were eligible for inclusion if they met the following criteria: 1) studies involved the comparison of the efficacy and safety of TXA usage in femoral fracture surgery and 2) studies included at least one of the outcome measures. Studies were excluded if 1) case reports and publications only included an abstract; 2) they included other types of fractures; 3) they were not published in English and 4) there was duplicate publication. The following data were independently extracted from each of the included studies by two investigators: first author names, published year, sample size, mean age, anesthesia methods, fracture type, surgical management, intervention, control, thromboprophylaxis, transfusion criteria and follow-up. Disagreement was resolved by consulting the reviewer. The end points included total blood loss, postoperative hemoglobin decline, transfusion rate, thromboembolic events, 90-day mortality and operative time. Two investigators independently assessed the quality of the randomized controlled trials (RCTs) according to the methods of the 12-item scale.14 Each item was scored “Yes”, “Unclear” or “No”. A trial with a score of more than 7 “Yes” was considered as of high quality, more than 4 but no more than 7 was considered as of moderate quality and no more than 4 was considered as of low quality. The Methodological Index for Non-Randomized Studies (MINORS) criteria was used to assess non-RCTs and was scored from 0 to 24.15 Agreement on the outcome was assessed by the means of a kappa test. Any different opinions were resolved by a third reviewer. The meta-analysis was conducted using Stata 14.0 software. For continuous outcomes, a weighted mean difference (WMD) and 95% CI were used. For dichotomous data, the risk difference (RD) with 95% CI was calculated as the summary statistics. Statistical heterogeneity was assessed using the value of P and I2. If P was >0.1 and I2 was <50%, the fixed-effects model was used; otherwise, the random-effects model was used to do analysis. Random-effects models were used to reduce heterogeneity. The assessment of publication bias and meta-regression could not be conducted because the most frequent outcome (transfusion rate) just included nine studies, and tests for them are generally performed only when at least 10 studies are involved. Owing to the limited information, subgroup analyses were just conducted on mean age (<65 years, ≥65 years). In addition, sensitivity analyses were conducted to insure the accuracy of the outcomes. All analyses were based on previous published studies; thus, no ethical approval and patient consent were required. A total of 1,559 potentially relevant references were founded. After the process of finding duplicates, 670 studies were excluded. By scanning the titles and abstracts, 874 studies were excluded from the analysis. After full texts carefully read for eligibility, two studies were excluded, because they were just an abstract.16,17 Finally, 12 RCTs18–21,23–30 and 1 retrospective cohort study22 were included. The characteristics of all included studies are shown in Tables 1 and 2. Note: All studies were RCTs except Lee et al (2015),22 which was an observational cohort study. *Observational cohort study. Abbreviations: IV, intravenous; TXA, tranexamic acid; I, intravenous TXA group; C, control group; NR, no report; RCT, randomized controlled trial. Abbreviations: TXA, tranexamic acid; T, topical TXA group; C, control group; NR, no report. The quality of RCTs is shown in Table 3. The value of weighted kappa for the agreement on these studies between reviewers was excellent (κ = 0.72). Ten studies18–21,23,25,26,28–30 were of high quality, and two studies were of moderate quality.24,27 The randomization methods were explicitly introduced in nine studies.18–20,23,25,26,28–30 Randomization allocation was concealed adequately in six studies.19,20,23,25,26,30 Nine RCTs provided the information of double blinding.18–21,23,25,26,28,30 None of them reported a binding of outcome assessment. However, all of the included studies were reported with complete outcome data. The quality of the cohort study is shown in Figure 2. Notes: aOnly if the method of sequence made was explicitly introduced could get a “Yes”. bDropout rate <20% could get a “Yes”, otherwise “No”. cITT = intention-to-treat, only if all randomized participants were analyzed in the group they were allocated to could receive a “Yes”. d“Yes” items more than seven means “High”, more than four but no more than seven means “Moderate” and no more than four means “Low”. Figure 2 The MINORS criteria. 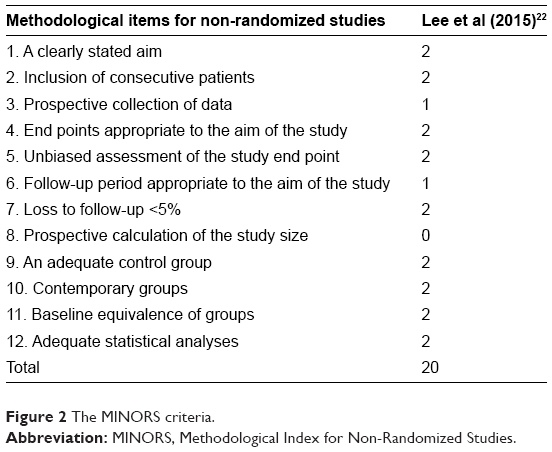 Abbreviation: MINORS, Methodological Index for Non-Randomized Studies. Four studies18,24,26,29 compared total blood loss. The data of them were pooled to do analysis. There was a significant heterogeneity between the studies (P < 0.1, I2 = 81.9%). Therefore, the random-effects model was used. 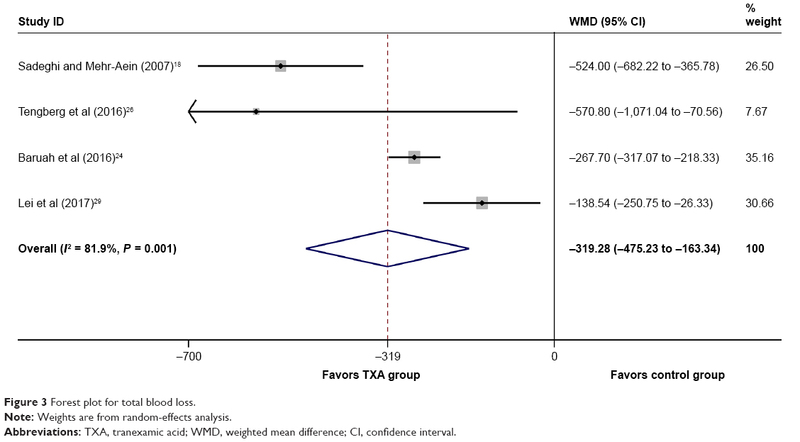 The pooled results manifested that the IV TXA group had a significant decrease in total blood loss (WMD = −319.282, 95% CI: −475.229 to −163.336, P = 0.000; Figure 3). Figure 3 Forest plot for total blood loss. Note: Weights are from random-effects analysis. Abbreviations: TXA, tranexamic acid; WMD, weighted mean difference; CI, confidence interval. Seven articles18,20–24,28 reported the outcome of postoperative hemoglobin decline. A significant heterogeneity was detected between the studies (P < 0.1, I2 = 75.4%). Therefore, the random-effects model was used to do analysis. The pooled results demonstrated that the IV TXA group had a lower postoperative hemoglobin decline (WMD = −1.144, 95% CI: −1.727 to −0.561, P = 0.000; Figure 4). Figure 4 Forest plot for postoperative hemoglobin decline. Abbreviations: IV, intravenous; TXA, tranexamic acid; WMD, weighted mean difference; CI, confidence interval. Two articles21,27 reported the outcomes of postoperative hemoglobin decline. A significant heterogeneity was detected between the studies (P < 0.1, I2 = 92.0%); Therefore, the random-effects model was used to do the analysis. It showed no significant difference in postoperative hemoglobin decline between the topical TXA group and the control group (WMD = −1.137, 95% CI: −2.999 to 0.725, P = 0.231; Figure 4). Ten studies18–23,26,28–30 involved the comparison of transfusion rate. No significant heterogeneity was detected between the studies (P > 0.1, I2 = 3.8%). Therefore, the fixed-effects model was used to do the analysis. The results showed that the IV TXA group had a lower transfusion rate (RD = −0.172, 95% CI: −0.224 to −0.121, P = 0.000; Figure 5). Figure 5 Forest plot for transfusion rate. Abbreviations: IV, intravenous; TXA, tranexamic acid; RD, risk difference; CI, confidence interval. Three studies21,25,27 involved the comparison of transfusion rate. There was a significant heterogeneity between the studies (P > 0.1, I2 = 54.5%). Therefore, the random-effects model was used to do the analysis. It showed no significant difference in the transfusion rate between the two groups (RD = −0.098, 95% CI: −0.225 to 0.029, P = 0.129; Figure 5). Nine studies19–24,26,29,30 reported thromboembolic events. No significant heterogeneity was detected (P > 0.1, I2 = 9.0%), so the fixed-effects model was performed. It showed no significant difference in the rate of thromboembolic events between the two groups (RD = 0.008, 95% CI: −0.017 to 0.034, P = 0.507; Figure 6). 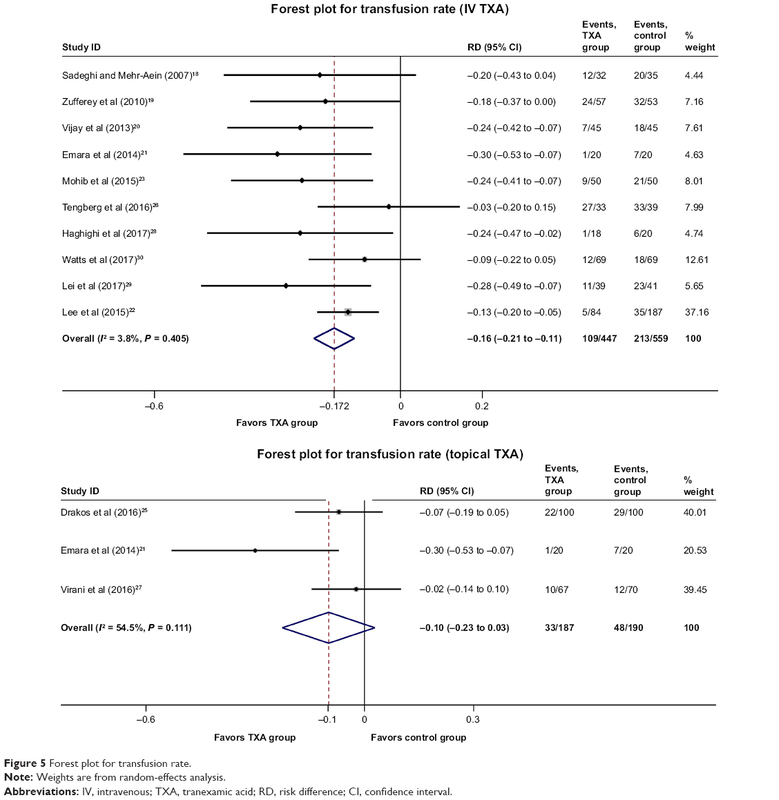 Figure 6 Forest plot for thromboembolic events. Abbreviations: IV, intravenous; TXA, tranexamic acid; RD, risk difference. Two studies21,25 reported thromboembolic events. No significant heterogeneity was detected (P > 0.1, I2 = 0%), so the fixed-effects model was performed. There was no significant difference in the rate of thromboembolic events between the two groups (RD = −0.017, 95% CI: −0.091 to 0.058, P = 0.66; Figure 6). Five studies18,22,26,29,30 reported 90-day mortality. No significant heterogeneity was detected (P > 0.1, I2 = 17%), so the fixed-effects model was performed. It showed no significant difference in 90-day mortality between the groups (RD = 0.009, 95% CI: −0.040 to 0.058, P = 0.732; Figure 7). Figure 7 Forest plot for 90 days mortality. Abbreviations: RD, risk difference; TXA, tranexamic acid. Only one study25 reported outcome of mortality. The rate was 13% (13 patients) in the TXA group and 14% (14 patients) in the control group (P > 0.05) during the first 12 months after surgery. The operative time was reported in seven studies.19–21,23,28–30 There was no significant heterogeneity between the two groups (P > 0.1, I2 = 0.0%); therefore, the fixed-effects model was used. The result manifested that no significant difference was detected. (WMD = −2.227, 95% CI: −4.904 to 0.450, P = 0.103; Figure 8). 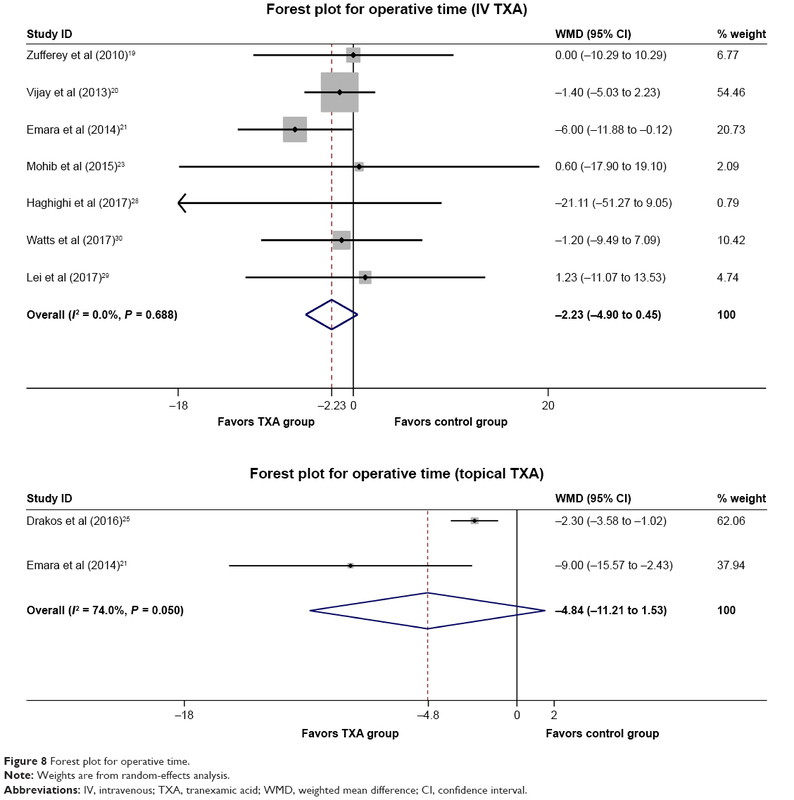 Figure 8 Forest plot for operative time. The operative time was reported in two studies.21,25 There was a significant heterogeneity between the studies (P < 0.1, I2 = 74.0%). Therefore, the random-effects model was used. The result manifested that no significant difference was detected (WMD = −4.842, 95% CI: −11.214 to 1.530, P = 0.136; Figure 8). As fewer studies were concerning topical TXA, so we just made sensitivity analysis in outcomes of studies that involved IV TXA usage. All the outcomes kept stable after the exclusion of each study once a time, and it showed some result when using a random effect. Owing to the lack of related studies, subgroup analysis was just conducted on postoperative hemoglobin decline, transfusion rates and thromboembolic events. Concerning postoperative hemoglobin decline, subgroup analysis showed no significant difference between the mean age <65 years group (WMD = −1.740, 95% CI: −2.767 to −0.713, P = 0.001) and mean age >65 years group (WMD = −0.565, 95% CI: −0.844 to −0.285, P = 0.000). Concerning transfusion rates, subgroup analysis showed no significant difference regarding mean age <65 years (RD = −0.239, 95% CI: −0.363 to −0.116, P = 0.000) and mean age >65 years (RD = −0.155, 95% CI: −0.211 to −0.099, P = 0.000). Regarding thromboembolic events, subgroup analysis showed no significant difference regarding mean age <65 years (RD = 0.053, 95% CI: −0.002 to 0.108, P = 0.061) and mean age >65 years (RD = −0.003, 95% CI: −0.031 to 0.025, P = 0.832). The most important findings of our meta-analysis were that TXA reduced transfusion rate without increasing thromboembolic events in femoral fracture surgery. 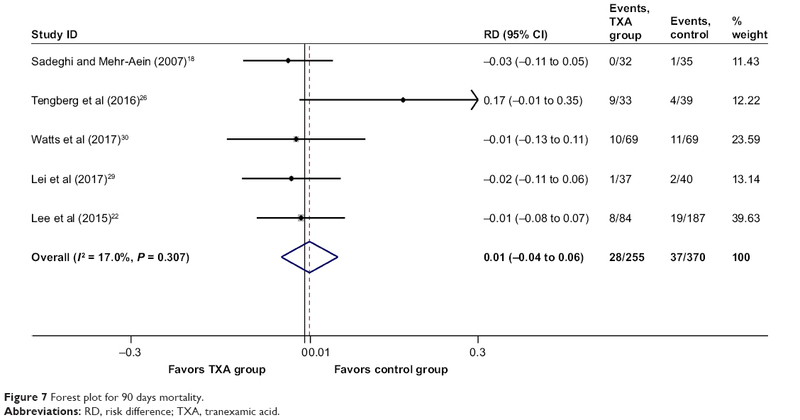 Although no significant differences were found in the transfusion rate regarding topical TXA, the topical group had a lower transfusion rate compared with the control group. However, a significant heterogeneity was detected in some outcomes. The limited data concerning TXA usage may be contributed to it. The differences in clinical measures should also be taken into consideration. There were limited studies focusing on TXA usage in femoral fracture surgery. Such reasons include older age, female gender, lower admission hemoglobin, higher American Society of Anesthesiologists grade, frailty and greater co-existing comorbidities. Patients suffering from femoral fractures were more susceptible to thromboembolic events comparing with patients undergoing elective joint replacement.31 Therefore, there is still clinical uncertainty regarding TXA application in femoral fracture patients. However, the potential benefits of TXA in significantly decreasing blood loss and transfusion rates are overwhelming. In addition, TXA could bring improved functional recovery, shorter length of hospital stay and lower cost.18 Therefore, the potential benefits of TXA in femoral fracture patients may outweigh the risk of it. At present, the common methods of IV TXA usages are preoperative dose of 1 g or 10–15 mg/kg (sometimes, second dose was added after 3 or 6 h) or combined use of continuous infusion for >8 h. Lanoiselée et al32 pointed out that TXA plasma concentrations were maintained for >10 mg/L during surgery and for a minimum of 3 h with a preoperative TXA dose of 1 g in hip arthroplasty. However, keeping TXA concentrations above this threshold up to 16 h could not reduce blood loss more effectively. Zufferey et al33 also reported that a continuous infusion of 1 g TXA after a preoperative bolus of TXA in hip replacement did not achieve any further reduction in blood loss. Piolanti et al34 divided 80 patients who underwent primary unilateral minimally invasive TXA into two groups: one group received two IV doses of 10 mg/kg of TXA and the other group received two doses of 20 mg/kg. They found that a dose of 10 or 20 mg/kg provides statistically similar results in blood loss sparing, and they pointed that the use of two 10 mg/kg doses could be considered more advisable in order to reduce the potential thromboembolic risks. In the trial of Sun et al,35 180 patients who underwent primary unilateral total knee arthroplasty were randomized into four groups. In group A, TXA (30 mg/kg) was infused 15 min before tourniquet inflation. In group B, TXA (15 mg/kg) was infused 15 min before tourniquet inflation and 3 h postoperatively. As for group C, TXA (10 mg/kg) was infused 15 min before tourniquet inflation and 3 and 6 h postoperatively. In all, 250 mL of normal saline without TXA was infused 15 min before tourniquet inflation in group D. They concluded that the preoperative dose and an additional dose of TXA were superior to a single preoperative dose of TXA in reducing blood loss and one additional dose was comparable to two additional doses of TXA in reducing blood loss. Owing to a lack of systemic absorption, topical usage should be taken into consideration. Although no significant differences were found in our meta-analysis, the topical group had a lower transfusion rate. Drakos et al25 reported that topical TXA used around the fracture site in elderly patients undergoing surgery of intertrochanteric fractures was safe and cost-effective, and a significant reduction in blood loss and transfused blood units and health care cost could be achieved. In addition, Emara et al21 demonstrated that topical TXA as an effective way to decrease blood and transfusion rates was safer comparing with IV TXA. However, Virani et al27 considered that TXA does not play a significant role in reducing postoperative blood loss and blood transfusion when used locally in pertrochanteric fracture surgery. Blocking the lysine-binding sites on plasminogen to inhibit the activation of plasminogen and finally interfering with fibrinolysis is the mechanism of TXA. TXA itself does not increase the synthesis of fibrin, so TXA in theory does not lead to a high coagulation state after surgery and certainly not an increase in thromboembolic events. Benoni and Fredin36 also suggested that TXA does not affect the risk of DVT because it inhibits fibrinolysis in the wound, not in circulation. The Clinical Randomisation of an Antifibrinolytic in Significant Haemarrhage-2 study included 20,000 patients; most of them suffered from significant hemorrhage. 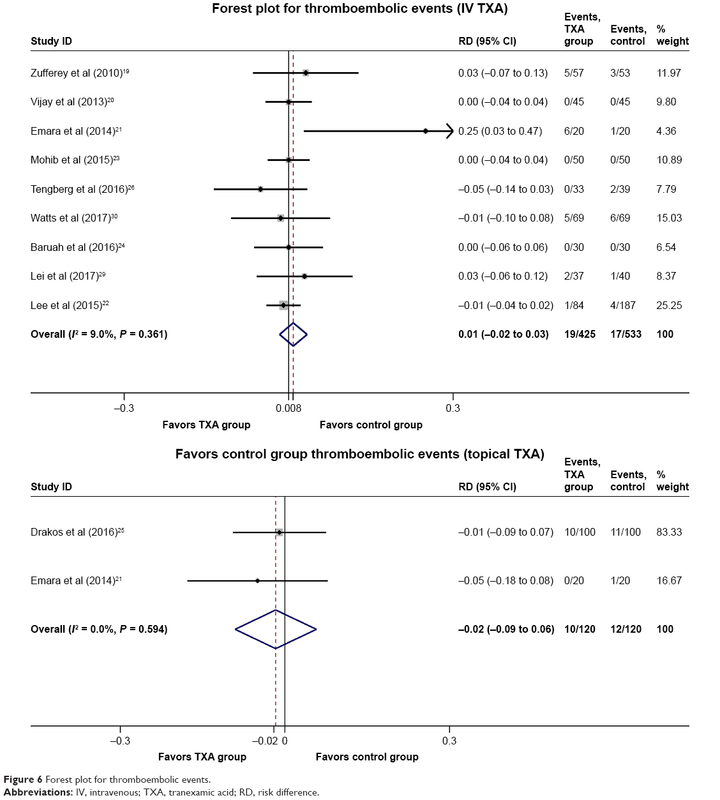 It showed that TXA safely reduced the risk of death in bleeding trauma patients.37 A large sample size study carried out by Poeran et al38 involving 872,416 patients showed no increased risk of complications, including thromboembolic events and renal failure, with TXA usage in joint replacement surgery. The key aspects for future research are as follows. 1) High-quality RCTs regarding different TXA dosages and timing still are needed to acquire a better application. 2) The thrombotic risk is of vital importance to its recommendation, so large and high-quality studies should focus on the safety of TXA application, especially in the elderly. 3) The use of topical TXA is a new challenge in controlling intraoperative blood loss among the major orthopedic surgery. RCTs with a larger sample size and a longer follow-up time are necessary to precisely compare IV and topical administrations of TXA. 4) Early surgery has been reported with a lower risk of death and lower rates of postoperative pneumonia and pressure sores among elderly patients with hip fracture.39 In femoral fractures frequently accompanied by a high initial blood loss, early TXA may decrease the incidence rate of preoperative anemia and then bring an earlier surgery. 5) Most previous studies have excluded patients with significant cardiorespiratory comorbidities and preoperative anemia, which are prevalent features in the elderly fracture population, so whether TXA is safe in these patients needs further research. 6) Combined IV and local TXA has proved efficacy and safety in joint replacement; this kind of TXA administration may be also useful in femoral fracture surgery. The limitations of this study are as follows. 1) Significant heterogeneity was found in the outcomes of total blood loss and postoperative hemoglobin decline. The differences in TXA dosage, duration, time of administration and number of administered times, fracture type, surgical measurements and transfusion criteria may be contributed to it. As the included studies showed different TXA dosages and timing still, therefore, it was impossible to make subgroup analysis of them across studies. 2) There were very few studies involving topical TXA, so it is hard to make further analysis of it. 3) The publication bias exists. Our meta-analysis demonstrated that both IV and topical application of TXA reduced transfusion rate in femoral fracture surgery. However, still further studies are needed to identify the optimal route of administration, TXA dosage and timing still. In addition, high-quality RCTs with a large sample size are required to figure out the safety of TXA application, especially in the elderly, before its wide recommendation. J Wang and P Zhang made substantial contributions to conception and design. P Chen and J Bai took acquisition of data and interpretation of data; J He and Y Liang performed statistical analysis. P Zhang drafted the article. All authors contributed toward data analysis, drafting and critically revising the paper and agree to be accountable for all aspects of the work. All authors read and approved all aspects of the work. Gregersen M, Borris LC, Damsgaard EM. Blood transfusion and overall quality of life after hip fracture in frail elderly patients – the transfusion requirements in frail elderly randomized controlled trial. J Am Med Dir Assoc. 2015;16(9):762–766. Shokoohi A, Stanworth S, Mistry D, Lamb S, Staves J, Murphy MF. The risks of red cell transfusion for hip fracture surgery in the elderly. Vox Sang. 2012;103(3):223–230. Allain JP, Stramer SL, Carneiro-Proietti AB, et al. Transfusion-transmitted infectious diseases. Biologicals. 2009;37(2):71–77. García-Alvarez F, Al-Ghanem R, García-Alvarez I, López-Baisson A, Bernal M. Risk factors for postoperative infections in patients with hip fracture treated by means of Thompson arthroplasty. Arch Gerontol Geriatr. 2010;50(1):51–55. Vamvakas EC, Blajchman MA. Transfusion-related mortality: the ongoing risks of allogeneic blood transfusion and the available strategies for their prevention. Blood. 2009;113(15):3406. Eubanks JD. Antifibrinolytics in major orthopaedic surgery. J Am Acad Orthop Surg. 2010;18(3):132. Li G, Sun TW, Luo G, Zhang C. Efficacy of antifibrinolytic agents on surgical bleeding and transfusion requirements in spine surgery: a meta-analysis. Eur Spine J. 2017;26(1):140–154. Myles PS, Smith JA, Forbes A, et al. Tranexamic acid in patients undergoing coronary-artery surgery. N Engl J Med. 2017;376(2):136. Ngichabe S, Obura T, Stones W. Intravenous tranexamic acid as an adjunct haemostat to ornipressin during open myomectomy. A randomized double blind placebo controlled trial. Ann Surg Innov Res. 2015;9(1):10. 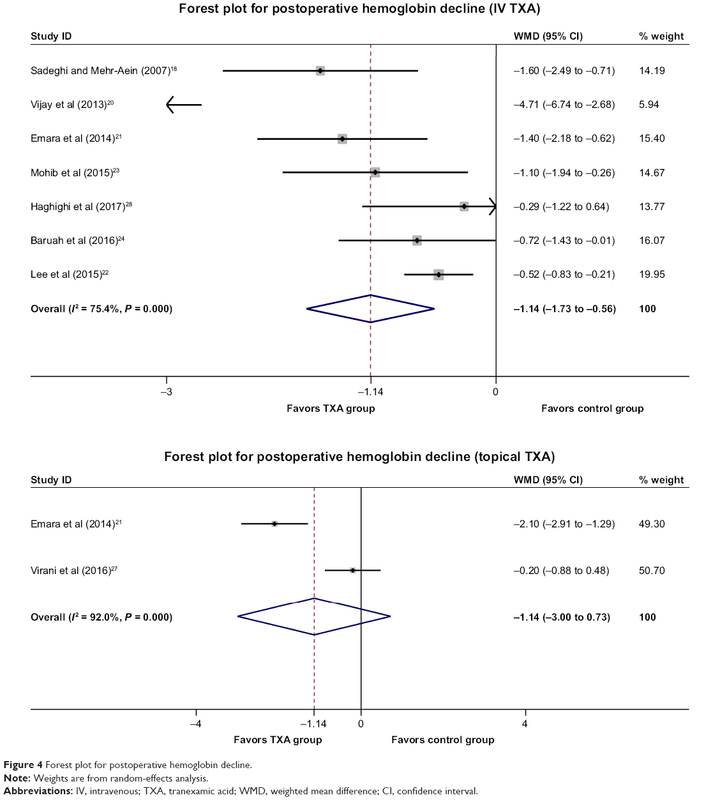 Xie J, Hu Q, Huang Q, Ma J, Lei Y, Pei F. Comparison of intravenous versus topical tranexamic acid in primary total hip and knee arthroplasty: an updated meta-analysis. Thromb Res. 2017;153:28–36. Li JF, Li H, Zhao H, et al. 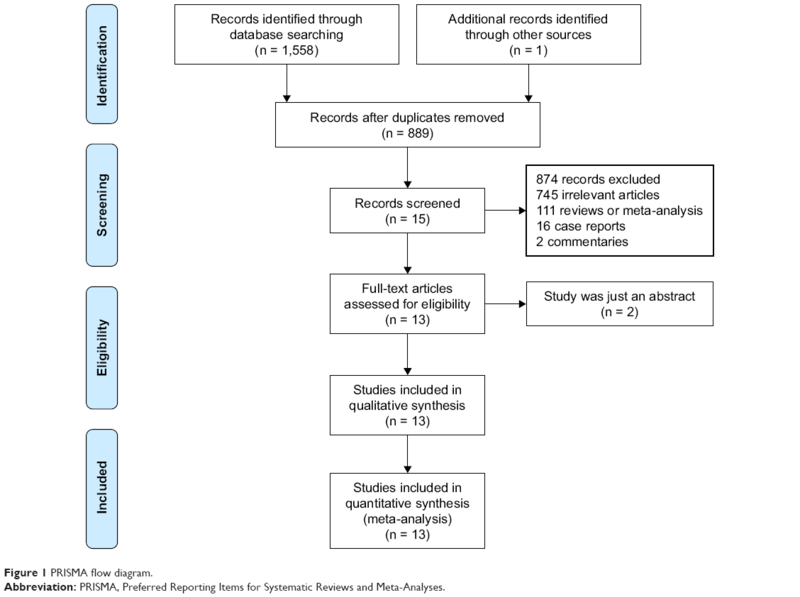 Combined use of intravenous and topical versus intravenous tranexamic acid in primary total knee and hip arthroplasty: a meta-analysis of randomised controlled trials. J Orthop Surg Res. 2017;12(1):22. Yi Z, Bin S, Jing Y, Zongke Z, Pengde K, Fuxing P. Tranexamic acid administration in primary total hip arthroplasty: a randomized controlled trial of intravenous combined with topical versus single-dose intravenous administration. J Bone Joint Surg Am. 2016;98(12):983–991. Zhang P, Liang Y, Chen P, Fang Y, He J, Wang J. Combined application versus topical and intravenous application of tranexamic acid following primary total hip arthroplasty: a meta-analysis. BMC Musculoskelet Disord. 2017;18(1):90. Furlan AD, Pennick V, Bombardier C, Van TM, Board E. 2009 updated method guidelines for systematic reviews in the Cochrane Back Review Group. Spine. 2009;34(18):1929–1941. Slim K, Nini E, Forestier D, Kwiatkowski F, Panis Y, Chipponi J. Methodological index for non-randomized studies (minors): development and validation of a new instrument. ANZ J Surg. 2003;73(9):712. Angulo Tabernero M, Aguilar Ezquerra A, Cassinello Ojea C, Ungria Murillo J, Martín Hernández C. Tranexamic acid in osteoporotic hip fracture surgery. Osteoporos Int. 2015;26(1):S379–S380. Moghaddam MJ, Darabi E, Sheikholeslamy F. Effect of tranexamic acid in decreasing need to transfusion in hip fracture surgery. Eur J Anaesthesiol. 2011;28:89. Sadeghi M, Mehr-Aein A. Does a single bolus dose of tranexamic acid reduce blood loss and transfusion requirements during hip fracture surgery? A prospective randomized double blind study in 67 patients. Acta Med Iran. 2007;45(6):437–442. Zufferey PJ, Miquet M, Quenet S, et al. Tranexamic acid in hip fracture surgery: a randomized controlled trial. Br J Anaesth. 2010;104(1):23–30. Vijay BS, Bedi V, Mitra S, Das B. Role of tranexamic acid in reducing postoperative blood loss and transfusion requirement in patients undergoing hip and femoral surgeries. Saudi J Anaesth. 2013;7(1):29–32. Emara WM, Moez KK, Elkhouly AH. Topical versus intravenous tranexamic acid as a blood conservation intervention for reduction of post-operative bleeding in hemiarthroplasty. Anesth Essays Res. 2014;8(1):48–53. Lee C, Freeman R, Edmondson M, Rogers BA. The efficacy of tranexamic acid in hip hemiarthroplasty surgery: an observational cohort study. Injury. 2015;46(10):1978–1982. Mohib Y, Rashid RH, Ali M, Zubairi AJ, Umer M. Does tranexamic acid reduce blood transfusion following surgery for inter-trochanteric fracture? A randomized control trial. J Pak Med Assoc. 2015;65(11 suppl 3):S17–S20. Baruah RK, Borah PJ, Haque R. Use of tranexamic acid in dynamic hip screw plate fixation for trochanteric fractures. J Orthop Surg (Hong Kong). 2016;24(3):379–382. Drakos A, Raoulis V, Karatzios K, et al. Efficacy of local administration of tranexamic acid for blood salvage in patients undergoing intertrochanteric fracture surgery. J Orthop Trauma. 2016;30(8):409–414. Tengberg PT, Foss NB, Palm H, Kallemose T, Troelsen A. Tranexamic acid reduces blood loss in patients with extra capsular fractures of the hip: results of a randomised controlled trial. Bone Joint J. 2016;98-b(6):747–753. Virani SR, Dahapute AA, Panda I, Bava SS. Role of local infiltration of tranexamic acid in reducing blood loss in peritrochanteric fracture surgery in the elderly population. Malays Orthop J. 2016;10(3):26–30. Haghighi M, Ettehad H, Mardani-Kivi M, et al. Does tranexamic acid reduce bleeding during femoral fracture operation? Arch Bone Jt Surg. 2017;5(2):103–108. Lei J, Zhang B, Cong Y, et al. Tranexamic acid reduces hidden blood loss in the treatment of intertrochanteric fractures with PFNA: a single-center randomized controlled trial. J Orthop Surg Res. 2017;12(1):124. Watts CD, Houdek MT, Sems SA, Cross WW, Pagnano MW. Tranexamic acid safely reduced blood loss in hemi- and total hip arthroplasty for acute femoral neck fracture: a randomized clinical trial. J Orthop Trauma. 2017;31(7):345–351. Smith GH, Tsang J, Molyneux SG, White TO. The hidden blood loss after hip fracture. Injury. 2011;42(2):133. Lanoiselée J, Zufferey PJ, Ollier E, Hodin S, Delavenne X; PeriOpeRative Tranexamic acid in hip arthrOplasty (PORTO) study investigators. Is tranexamic acid exposure related to blood loss in hip arthroplasty? A pharmacokinetic-pharmacodynamic study. Br J Clin Pharmacol. 2018;84(2):310–319. Zufferey PJ, Lanoiselee J, Chapelle C, et al. Intravenous tranexamic acid bolus plus infusion is not more effective than a single bolus in primary hip arthroplasty: a randomized controlled trial. Anesthesiology. 2017;127(3):413–422. Piolanti N, Del Chiaro A, Matassi F, et al. Clinical and instrumental evaluation of two different regimens of tranexamic acid in total hip arthroplasty: a single-center, prospective, randomized study with 80 patients. Eur J Orthop Surg Traumatol. 2018;28(2):233–237. Sun Q, Yu X, Wu J, Ge W, Cai M, Li S. Efficacy of a single dose and an additional dose of tranexamic acid in reduction of blood loss in total knee arthroplasty. J Arthroplasty. 2017;32(7):2108–2112. Benoni G, Fredin H. Fibrinolytic inhibition with tranexamic acid reduces blood loss and blood transfusion after knee arthroplasty: a prospective, randomised, double-blind study of 86 patients. J Bone Joint Surg Br. 1996;78(3):434–440. Williams-Johnson JA, McDonald AH, Strachan GG, Williams EW. Effects of tranexamic acid on death, vascular occlusive events, and blood transfusion in trauma patients with significant haemorrhage (CRASH-2) A randomised, placebo-controlled trial. West Indian Med J. 2010;59(6):612–624. Poeran J, Rasul R, Suzuki S, et al. 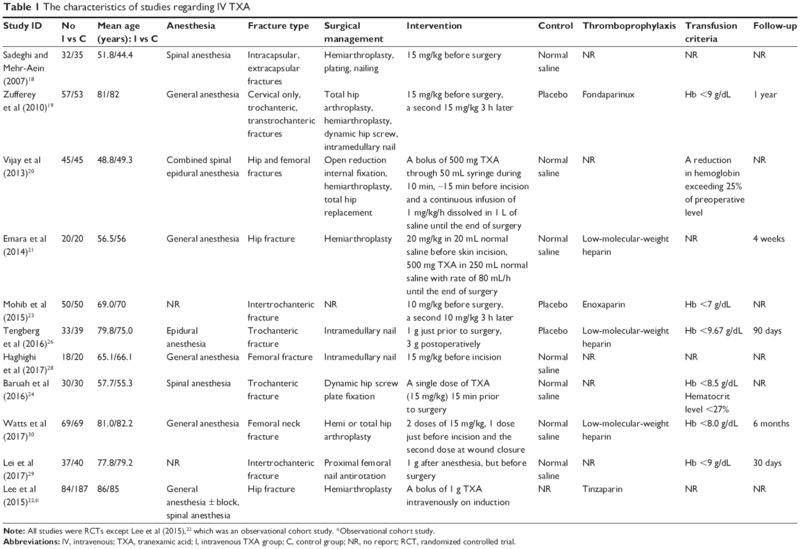 Tranexamic acid use and postoperative outcomes in patients undergoing total hip or knee arthroplasty in the United States: retrospective analysis of effectiveness and safety. BMJ. 2014;349(8):g4829. Simunovic N, Devereaux PJ, Sprague S, et al. Effect of early surgery after hip fracture on mortality and complications: systematic review and meta-analysis. CMAJ. 2010;182(15):1609.